What is the Spring Concert? You’ve heard us talking about it. You know it’s important. You’ve seen it mentioned EVERYWHERE You know there’s a lot of excitement around it … but what exactly IS the Spring Concert? The recital is a memorable opportunity for our students to showcase their talents onstage. 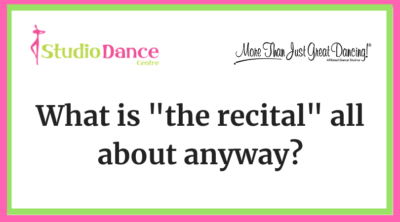 From learning the first eight-count of choreography in class to the final bow onstage, the recital is one of the biggest highlights of a dancer’s year! Consider this blog post your “recital primer,” where we break down a few key elements of what to expect these next few months—and why it’s all so important. Each class learns a particular routine to perform at the recital. The choreography is the series of steps, patterns, and formations the teacher creates for each unique routine. Your dancer will be learning and practicing this choreography during class time leading up to the recital. This repetition allows our students to grow their confidence as well as their skills. Because dance is a performing art, this is where the “performance” aspect truly comes together! As you’ve seen, each class will have a costume to wear onstage for their routine. We will also be communicating specific instructions regarding their hairstyle and stage makeup. These three things are the finishing touches that complete a performer’s look! Prior to the recital, each class will have the chance to participate in our dress rehearsal. The dress rehearsal is almost like the recital itself, except it’s just for practice. It allows us the chance to rehearse our sound and lighting cues from backstage and helps us make sure the dancers are familiar with their new surroundings. This is it! After all the preparation and practice, this is each dancer’s moment in the spotlight in front of their family and friends. The buildup of excitement is huge. It’s like when an athlete performs at the Olympics … our students perform at the recital! We understand that the thought of choreography, costumes, rehearsals, and being onstage in can be intimidating at first, so we’re here to show you what an awesome experience this journey can be. Stay tuned here to the SDC blog for more valuable insight as we approach the big day!